Here is an HO Log truck with a load of logs check out the chain molded onto the log load. Some minor assembly is required and of course the castings come unpainted. The casting measures 3" by 7/8" and 1" tall. 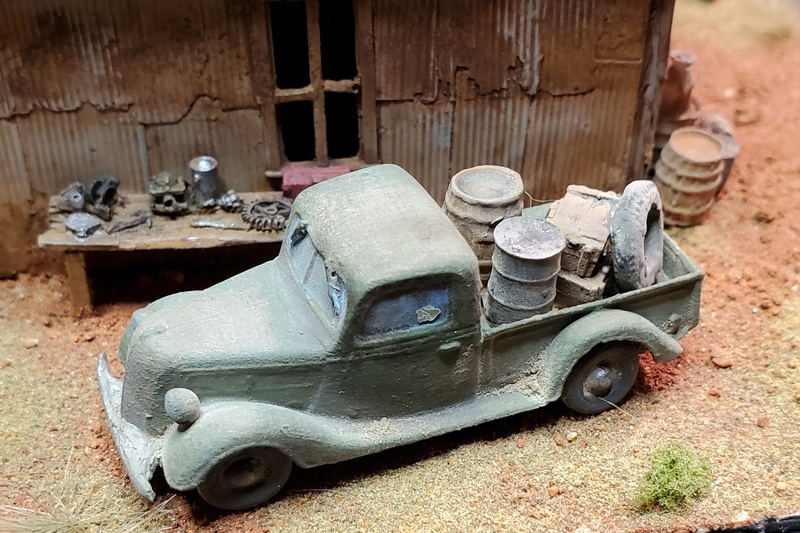 Here is an HO Stack truck with a load of oil drums that you can use as a load or make your own load and use this load as a junk pile. Some minor assembly is required and of course the castings come unpainted. The casting measures 3" by 7/8" and 1" tall. Here is an HO tank truck. All you have to do is add the tires then paint it. This could work to transfer fuel or as a water truck. The casting measures 2 1/4" by 1" and 1" tall. This casting is unpainted. Here is an HO Dump truck with a load of coal. The coal load is removable for you to add your own load. Some minor assembly is required and of course the castings come unpainted. The casting measures 2 1/2" by 7/8" and 1" tall. Here is an HO tank truck to fuel your truck fleet. Some minor assembly is required and of course the castings come unpainted. The casting measures 3" by 7/8" and 1" tall. Here is a truck with a pipe load on the bed. Great little background item for you truck guys. Some minor assembly is required to build this one. Truck measures 2 1/2" long by 1 1/4" wide by 1 1/8" tall. Castings come unpainted and all resin castings. This is a set of four different truck bodies you can add to your existing trucks like Jordan or wheel work trucks. These castings come unpainted and are resin.